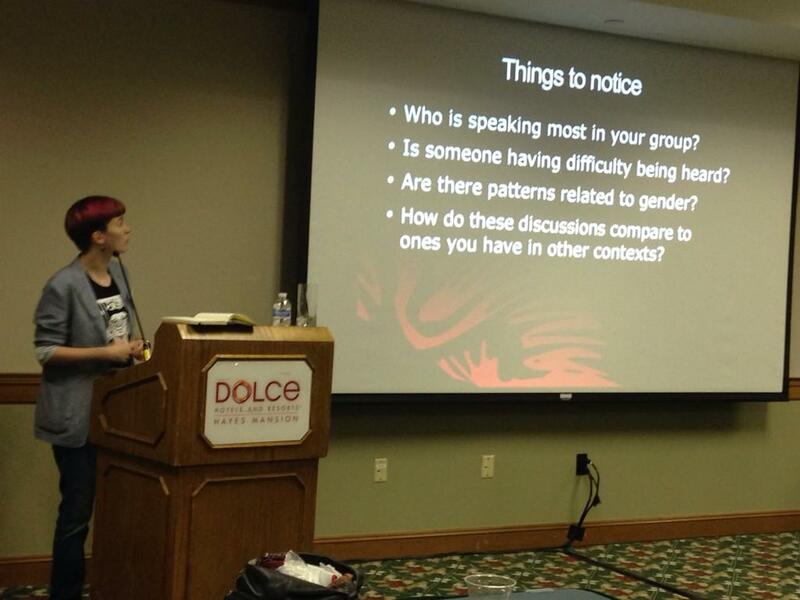 Yours truly teaching an Ally Skills workshop for the EEOC. Over the years, I’ve had hundreds of conversations with people of all genders (but mostly men) about what we can do to make tech, and information security in particular, a better place for women. Kids’ programs like r00tz and HacKid make it clear that plenty of girls want to be hackers early on. There is some awesome work happening specifically around increasing the number of women entering the pipeline – NYU’s Career Discovery symposium for women, ACSA‘s scholarships for women studying information security, Tennessee Tech’s Women in Cyber Security Conference, the EWF‘s fellowship at Carnegie Mellon, and many others. But we also have to make things better for the women who are already here. I myself had a scary brush with burnout in the past year, and with a lot of work and amazingly supportive colleagues I’ve gotten through it. I want to stay in this field – but I need your help to make that happen. So if you’ve ever benefited from something I said or did – had an “ah-ha!” moment, got an interview you wanted, or finally understood threat modeling – I’m asking you to donate to the organization that kept me on this side of burnout: the Ada Initiative. Knowing that I’m not alone – that these people support me and they are going to take action when they see bad stuff going down – lets my shoulders come down from around my ears and allows me to think, hey, maybe I can keep doing this. So I’m making you a challenge – two challenges, actually. First, if the rest of you donate $2048, I’ll match that donation with my own money. My employer, Salesforce.com, will match that dollar-for-dollar – so the impact of your donation will be tripled. Last year, I made a matching challenge to my friends in the name of my grandmother, architect Janet Leys Mactavish Shaw. You can read about her on Wikipedia – she was a badass lady who would have loved hacking and open technology and culture had she lived to see them happen. And here’s my second challenge: I heard from a lot of people who were unable to make the workshops in Las Vegas that they would love to attend one. So if we can raise $4096, I will personally teach a free workshop – with content I’ve written specifically for information security – in San Francisco in the next six months. Scaling this workshop up is, to me, one of the most powerful things happening right now in working to improve conditions for women in geeky fields, and especially information security. I want you to join me in making this happen. Well it seems your donation goal was easily reached.